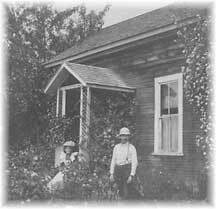 It was a land of berry bushes, tall timber, chicken ranches and fishing boats. Accessible only by water and populated only by a hardy sort, the Peninsula area during the early 1900s… As a frontier made the slow transition to civilization, the progressive among this land realized they could not afford to be left out of industry’s evolution toward electrical power. . . . Soon it became obvious that no outside agency was going to provide an electrical utility in the Peninsula area… A handful of local residents realized that if they were to ever see lights in their chicken sheds and their homes, they would have to make it happen themselves. . . . “You couldn’t get any money from Wall Street. They thought it was all Indians out here,” said Oak Lodholm, General Manager of Peninsula Light from the 1930s to 1973. Read more by downloading Pioneering a Power System, written in September 1988. Read more about this and other personal stories about Joe and Laura Hoots, Betsy and Chuck Allen, Jane Shaw Karlson, Paul and Helen Alvestad, Leroy Challender, Melvin and Jane Etta Cady, and Donald and Shirley Olson by downloading PenLight Pioneers Reminisce. 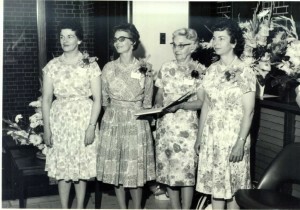 Following is a short list of interesting dates spanning from 1926 to 1986. 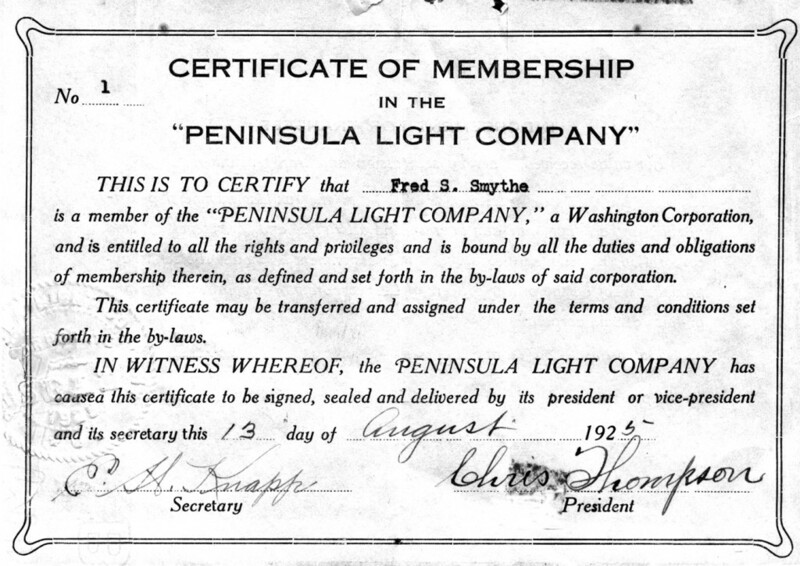 July 14, 1924—PLC was issued its first commercial license to operate. The license was issued by Secretary of State Grant Hinckle, paid for by Earl Knapp. July 13, 1925—The first Articles of Incorporation were adopted. They were drafted by Homer T. Bone, a Tacoma attorney who was an early leader of public power in the Northwest. The Board held meetings everywhere: Empress Theater, Peninsula Hotel, Washington Egg and Poultry Association, Old Schoolhouse, Home and Philip Peyran’s house. In August 1925—Board approved purchase of a binder for the meeting minutes “… if the price was reasonable”. 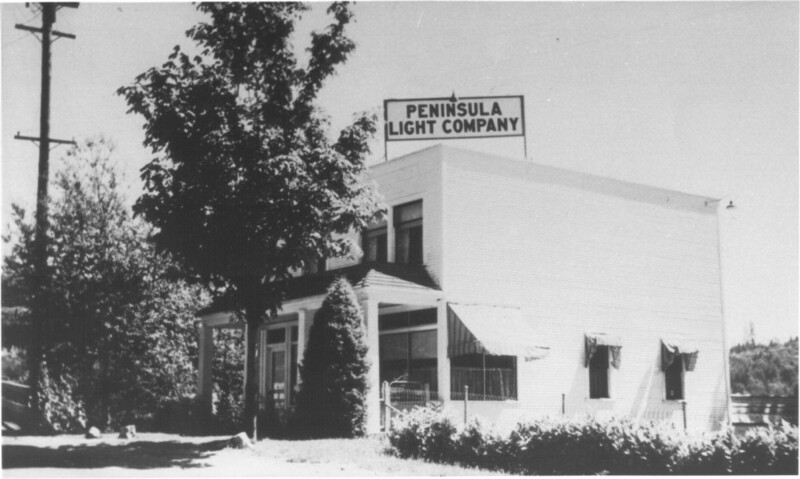 1925—Penlight moved into the Eve-Glo Building. Fox Island Light Company proposes to be served by PLC; raises funds for underwater line; PLC guarantees service if 100 memberships can be obtained. December 7, 1925—The first annual meeting was held. 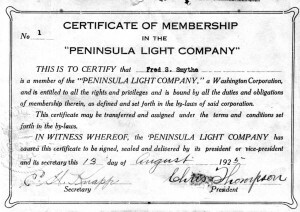 December 14, 1926—Peninsula Light Company was officially energized with power supplied by Tacoma City Light, but operation apparently ceased when funds ran out. Board members began membership drives and personally collected the memberships: cash and notes and transformer bills. They had a difficult time. March 1927—55 miles of line were up. December of 1927—74 miles of line served 457 members. 1930s—Fox Island is service completed. Because of the Depression, moves are made to cut salaries of employees. Mr. Hughes volunteers to cut his salary to $125; linemen to $5 per day. Hiring restricted but if absolutely necessary, and married men were to be given preference. 1932— 192 miles of line served 878 members . McNeil Island service completed. A new 1.5 ton Ford pickup truck is purchased in 1932 for $575 (from Uddenberg’s). 1933—A.R. Hunt comes to terms to sell property and Eve-Glo building on Harborview to PenLight for $15,000. July 4, 1940 —First Narrows Bridge (Galloping Gurtie) opens. November 7, 1940— Galloping Gurtie falls. 1964—Move into “new” PenLight building on Harborview Drive. December 20, 1976—A court decision known as the Otter Tail ruling allowed PLC to use Tacoma’s transmission system to switch to its first federal electricity from BPA. 1986—PenLight moves into a modern new headquarters building on Goodnough Drive. The building wins a design award from the local Chamber of Commerce.